Those of you with babies, toddlers and children always love it when a New Mothercare Sale goes live, and so we suspect that there were plenty of smiling faces yesterday. This is because Mothercare launched their latest sale, and we took a trip to our nearest store to see just what promotions were running. From what we could see, this has to be one of the biggest Mothercare Sales we have seen in a while, and covered everything from clothing, travel, furniture, toys, feeding and so much more. There is up to 50% off selected clothing, along with 20% off all full priced clothes. There’s also 10% off Home and travel, and 25% off selected toys, which is running in conjunction with a handy Flash Sale on toys. 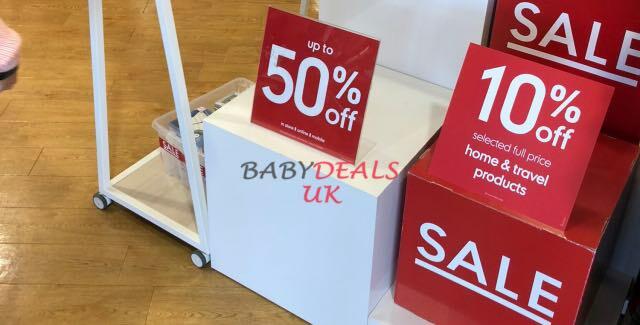 If you are interested, the Mothercare Sale is Live Online and in-store – but you might want to hurry because we know the best deals tend to go pretty quickly.